Aeromexico recorded a sharp drop in profits in 2Q2014 as market conditions in Mexico became unfavourable. An economic slowdown has coincided with rapid capacity expansion by Aeromexico and the overall Mexican market, putting pressure on yields. Aeromexico’s capacity was up by 17% in 2Q2014, driven by a 27% spike in international ASKs. The group has adjusted domestic capacity, which was up by less than 3% in 2Q2014, but competitors continued to pursue aggressive domestic expansion. Despite the relatively disappointing results Aeromexico has been consistently profitable over the past four years and boasts the highest margins in the Mexican airline industry. Challenging market conditions are likely to persist over the short term but the group’s medium to long term outlook is relatively bright. Following its recent market share gains Aeromexico should be in prime position to benefit as the Mexico economy improves and competition becomes more rational. Grupo Aeromexico on 28-Jul-2014 reported a net loss of MXP89 million (USD7 million) for the quarter ending 30-Jun-2014 compared to a net profit of MXP322 million (USD26 million) in 1Q2013. The net figure was impacted by the devaluation of the Mexican peso, which depreciated by 4% against the US dollar compared to 1Q2013. On an operating basis, Aeromexico extended its streak of consecutive profitable quarters to an impressive 17 as the group turned an operating profit of MXP202 million (USD16 million). However this represented a 73% reduction compared to 1Q2013 as intensifying competition led to declining yields. Group revenues were up 9% in 2Q2014 to MXP10.356 billion (USD797 million) despite a 22% increase in RPKs. ASKs were up by 17%, resulting in a 3.4ppts improvement in load factor to 79.3%. But the higher loads came at the expense of yields, which dropped by 12%. For the six month period RPKs were also up 22% while ASKs were up 15%, resulting in a 4.6ppts improvement in load factor to 79.3%. Yield in 1H2014 were down 13% as there was a slight improvement in the second quarter compared to the first quarter. Aeromexico executives are encouraged by the sequential quarter over quarter improvement in yields and said during a 29-Jul-2014 analyst call that they are optimistic of further yield improvements in 2H2014. But overall yields still remain under pressure in both the domestic and international markets. Domestically Aeromexico has adopted an aggressive pricing strategy in response to intensifying competition. Mexico’s economy expanded by less than 2% in 1H2014 but the Mexican domestic market grew by 9% to 15.4 million passengers, according to Mexico DGAC data. Aeromexico’s aggressive pricing strategy is aimed at ensuring the group maintains or increases its share of the domestic market share despite the more rapid capacity growth from competitors. The group’s domestic capacity was up by only 2.5% in 2Q2014 as a new more disciplined approach to capacity was implemented. As CAPA previously analysed, the group earlier revised its domestic capacity projections for 2014 from 9% to 12% ASK growth down to 7% to 10%. The lower fares are designed to match competitor fares and boost load factors at the expense of yield. For example, Aeromexico executives explained that it has matched Interjet’s fares on the LCC’s newly launched routes from Monterrey, which traditionally have been among the highest yielding domestic routes in Mexico. This follows a similar strategy used in other markets as Aeromexico’s rivals have entered new routes with aggressive pricing and capacity. Clearly the higher load factors are not sufficient to entirely offset the drop in yields. But the group believes maintaining market share as competition intensifies is paramount. The Aeromexico Group carried 37.2% of all domestic passengers in Mexico in 1H2014 compared to 35.3% in 1H2013, according to Mexico DGAC data. All three of Mexico’s LCCs – Interjet, Volaris and VivaAerobus – lost ground to Aeromexico as their passenger growth lagged the 15% growth from Aeromexico. 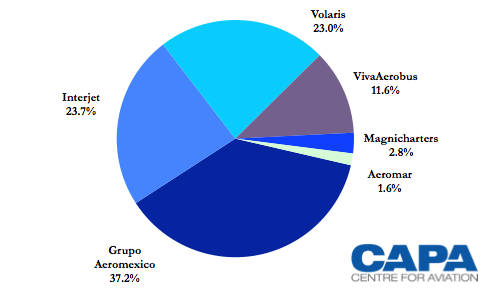 Volaris’ market share still increased marginally, from 22.6% to 23%, while Interjet’s market share slipped 1.2ppts to 23.7% and VivaAerobus’ also slipped by 1.2ppts to 11.6%. Interjet, which has been expanding rapidly on regional routes using its new fleet of Sukhoi Superjet 100s, grew scheduled domestic passenger traffic by only 4% in 1H2014 to 3.65 million, according to Mexico DGAC data. Volaris’ domestic traffic grew by 11% to 3.55 million while VivaAerobus’ domestic traffic dropped by 1% to 1.78 million. Load factor data for Interjet and VivaAerobus is not available as the carriers are privately held (both have delayed IPO plans until at least 2015 due to the unfavourable market conditions). But Volaris reported a 0.1ppt drop in domestic load factor in 1H2014 to 80.1% and a 2.3ppts drop in international load factor to 84.4%. In comparison, Aeromexico reported a 6.8ppts improvement in domestic load factor for 1H2014 to 77.4% and a 2.9ppts improvement in international load factor to 80.5%. Volaris reported an operating loss of USD7 million and a net loss of USD6 million for 2Q2014 but this represents a significant improvement compared to the USD95 million operating loss and USD75 million net loss in 2Q2013. Volaris’ yield was down by 10% as revenues were up only 9% to USD254 million despite a 14% increase in RPKs. Volaris is primarily a domestic carrier, although it has been expanding its trans-border operation to the US. In 1H2014, 25% of Volaris’ ASKs were in the international market compared to 24% in 1H2013. Aeromexico flew 63% of its ASKs in the international market in 1H2014 compared to 59% in 1H2013. Aeromexico also reported an even 50/50 split in domestic and international revenues. Aeromexico’s domestic RPKs and passenger numbers were both up by 15% in 1H2014 despite only a 5% increase in ASKs. Aeromexico mainline domestic traffic grew by 8% to 2.5 million passengers in 1H2014 while regional subsidiary Aeromexico Connect domestic traffic surged by 21% to 3.3 million, according to Mexico DGAC data. Aeromexico serves domestic trunk routes while Aeromexico Connect serves a mix of trunk routes, smaller routes from Mexico City and point to point routes. Aeromexico Connect has been expanding rapidly as it transitions its fleet to larger regional jets. Aeromexico Connect still operates 28 ERJ-145s but seven are being phased out in 2H2014 as eight additional E-jets are delivered for a total of 39. Aeromexico Connect’s Mexico City hub will only consist of E-jets (a mix E170s, E175s and E190s) by the end of 2014, leaving ERJ-145s for point to point routes. The entire ERJ fleet is due to be phased out by 2018 as part of the group’s plan to reduce its entire fleet to only three types – E-jets, 787s and 737-800s/MAX 8s – compared to six types currently. In addition to replacing ERJ-145s with E-jets, Aeromexico is rapidly replacing 124-seat 737-700s with 160-seat 737-800s. Aeromexico began 2014 with 28 737-700s and 19 737-800s; it plans to end 2014 with 23 737-700s and 25 737-800s. The up-gauging is a key component to the Aeromexico strategy as it allows it to better utilise slots at congested Mexico City while reducing its unit costs. Aeromexico Connect has been achieving a 16% CASK reduction on routes transitioning from ERJ-145s to E170s and a 9% improvement on routes transitioning from E170s to E190s. The swap at Aeromexico mainline from 737-700s to -800s results in a 14% CASK improvement while the transition from 767s to 787-8s on long-haul routes results in an 18% improvement. Aeromexico has been focusing expansion this year in the international market, which is not as competitive and with the exception of a few trans-border routes to the US, has not seen the irrational capacity increases that has plagued the domestic market. While Aeromexico competes against three ambitious LCCs in the domestic market and to the US, it is Mexico’s only long-haul carrier. Interjet and Aeromexico are also the only two Mexican carriers currently operating international flights to Latin America and the Caribbean. Aeromexico’s international ASKs were up 27% in 2Q2014 and 21% in 1H2014. As CAPA formulated in Jun-2014, the international capacity growth has been driven by the delivery over the past year of Aeromexico’s first five 787s, which have been used to up-gauge long-haul routes previously served by smaller 767s. Aeromexico executives acknowledge the rapid capacity expansion on routes such as Madrid, Paris London and Tokyo have impacted yields. But they maintain the 787 has been well received in the market place, new revenue management initiatives are starting to bear fruit and the influx of capacity that has been added to the market over the past year will eventually be fully absorbed. Aeromexico also confirmed during the 2Q2014 analyst call that it is moving the stopover on its Mexico City-Tokyo flight from Tijuana to Monterrey in Sep-2014. Aeromexico executives are optimistic the switch will improve the performance of the Tokyo route, where capacity has nearly doubled as a result of the transition to 787s as well as the introduction of a fourth weekly frequency. A very small portion of Tokyo-bound passengers were boarding at Tijuana. Monterrey should see higher local demand given it has a larger business community with stronger ties to Japan. Monterrey is also Aeromexico’s second largest hub and has been the focus of domestic and short-haul international expansion. Aeromexico also has announced the addition of five new domestic routes from Monterrey. However, the new Monterrey-Tokyo route throws a wrench into plans to upgrade Tokyo to non-stop in 2015 using a new batch of 787-8s which have higher rated engines. Aeromexico currently does not have any aircraft capable of operating non-stop from the high altitude of Mexico City to Tokyo but operates non-stop from Tokyo to Mexico City (which it will continue to do as the stop on the outbound leg moves from Tijuana to Monterrey). The idea of the previously planned non-stop in both directions was to offer an improved product in the local Tokyo-Mexico City market as well as offer better connections beyond Mexico City to points throughout Latin America. With the Monterrey stop Aeromexico will end up continuing to offer a less competitive two-stop product in the growing South America-Tokyo market. This will dilute Aeromexico’s ability to better leverage its position as the only Latin American airline serving Asia. Even with the recent acceleration in international capacity growth, Aeromexico only accounted for 14.6% of Mexico’s international market in 1H2014 based on Mexico DGAC passenger data. But this represents a 2.2ppts improvement over the 12.4% share the group captured in 1H2013. Other Mexican carriers accounted for a 7.3% share of Mexico’s international market in 1H2014 compared to 7% in 1H2013. Mexico’s international market has traditionally been dominated by foreign airlines, particularly US carriers. Foreign carriers captured 78.1% of Mexico’s international market in 1H2014 – their share dropped by 2.5ppts compared to 1H2013 despite growing traffic by 9% to 11.8 million as the Mexican carriers expanded even faster. While the fast rate of Aeromexico’s international capacity expansion has impacted its yield and profitability it is likely these are only short term issues given how small its market share is. A 15% share for any flag carrier in its home market is miniscule. There are huge opportunities for Mexican airlines to improve their position in the international market. Aeromexico in particular should benefit as it is Mexico’s only full-service airline and only widebody operator. Overall the group’s market share in Mexico has been on the rise despite the intense competition with its LCC competitors. Emerging markets typically see full-service airline market shares steadily slide as LCCs expand. Mexico has been an exception with Aeromexico steadily expanding its overall share of the Mexican market over the past 18 months. Aeromexico also has been consistently more profitable than its LCC competitors. Mexico’s LCCs are generally well positioned for growth. But Mexico’s LCC sector, which features three airlines with ambitious expansion plans, could become oversaturated. Consolidation is a possibility. While Aeromexico has seen declining profits so far in 2014, the group’s medium to long term outlook is relatively bright. The airline is hopeful economic growth in Mexico will return to more normal emerging market levels in 2015, boosting demand. At least for now Aeromexico is being “cautiously optimistic going forward,” according to CEO Andres Conesa. He said the group has not finalised its capacity plans for 2015 but expects to reduce overall ASK growth to the single digits compared to a projected 12% to 15% in 2014.
International capacity growth, which is expected to be up 15.5% to 19% in 2014, will be moderated significantly, allowing the capacity added in the first 18 months of 787 operations to be absorbed. Domestic capacity growth will be pegged to roughly two times GDP growth. Aeromexico vows to monitor demand closely and readjust capacity, including for the rest of 2014, if market conditions warrant. Aeromexico has the flexibility in its fleet plan to quickly adjust capacity. For example the airline recently adjusted its 2014 fleet plan by accelerating the retirement of two aircraft (see background information). If Aeromexico maintains its so called disciplined approach its outlook should improve. But a lot hinges on competitor behaviour and an economic rebound. Aeromexico ended 1H2014 with a group fleet of 119 aircraft, including 15 widebodies, 45 narrowbodies and 59 regional jets. It added a net of two aircraft in 1H2014 as two 787s and four E190s were delivered while two 737-700s and two ERJ-145s were returned. Aeromexico said during its 2Q2014 analyst call that it is accelerating the phase out of one 767-200 and one 737-700, resulting in a two-aircraft reduction in its 2014 fleet plan. The group now plans to end 2014 with a fleet of 121 aircraft as eight E-jets and five 737-800s are added while seven ERJ-145s, two 767s and two 737-700s are returned. Aeromexico was originally planning to retire only one 767 and one 737-700 in 2H2014, which would have given the group a year end total of 123 aircraft. The decision to accelerate the two retirements is sensible given current market conditions. It also shows the flexibility in Aeromexico’s fleet plan, which allows the group to adjust fleet and capacity growth depending on market conditions.